What do you do if an angel dubs you the Righteous One and tells you you're responsible for saving other souls on earth? 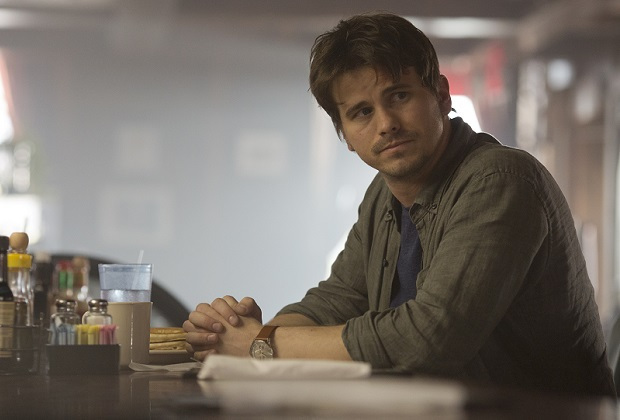 Naturally, you'd freak out and few actors do freak out as well as Jason Ritter. He plays Kevin, a burnt-out failed finance guy, who returns to his hometown to live with his sister and her daughter. Yvette (Kimberly Hébert Gregory) is one of 36 angels who fell to earth via a meteor who've been assigned to a human who can make a difference in the world. Only the chosen ones can see and hear them and that makes for some predictable comedy bits but Ritter sells it with his frazzled and spazzed behavior. You can't help but see his father, John Ritter, in his comedic abilities. John was the beloved actor known best for his portrayal of Jack Tripper on 'Three's Company.' Jason carries on his father's natural charm and penchant for exaggerated facial expressions while being totally vulnerable. Yvette is his guardian angel, in essence, and she takes her mission seriously and wants Kevin to take it seriously too. As you can imagine, it all seems crazy and unbelievable but he soon realizes he can make a difference and while doing so get his own life back together. It's a quirky mix of spirituality, science fiction, family drama, and supernatural comedy. The pilot has to explain a lot and it doesn't all click smoothly but the show certainly has its heart in the right place. Kevin isn't an entirely lost cause but has some baggage. After heading to the big city to make his fortune only to lose his job, his girlfriend, and nearly take his own life, Kevin hits rock bottom and returns to the Midwest to start over. Amy (JoAnna Garcia Swisher) is Kevin's widowed sister who's also a brilliant government scientist. She's the supportive and welcoming force he needs but has neglected for so long. Things aren't any easier when he tries to connect to his niece Reese (Chloe East). Yvette is determined to prepare him for his journey to make the world better. She's his guru too, or more like a Jedi Master teaching him how to feel his inner righteousness to find the other 35 chosen people. All he has to do is find them and hug them. Sounds easy enough, right? None of it would work if you don't buy Jason as this broken guy with a heart of gold. Luckily, Jason is the perfect actor to convey a whirlwind of emotions, and there's plenty of them especially the last fifteen minutes. It might be a little saccharin or corny at times but it all comes from a good place. There's nothing like this on TV and few shows want to make you feel good or enlightened. 'Kevin' is a sweet meditation on how to be a better person and how can anyone hate that? It's also entertaining even if all doesn't gel well. The different elements seem to clash at times. There are moments of slapstick, spiritualism, sci-fi, and heavy drama that brush up against each other. Nonetheless, Ritter shines and there's enough joy in his performance and in the show to be off to a promising start. Executive producers, Michele Fazekas, Tara Butters, Chris Dingess, Craig DiGregorio, Paul McGuigan (pilot only).